I accepted this award as the Oscar in our field of work. Given at the EU level, EEPA is the highest award in the field of entrepreneurship promotion. I didn’t expect it as it was the only time Bulgaria has ever been nominated for an EEPA. It was a big surprise – first ever nomination, first ever win – and the only one for us so far. This makes it even more precious for me and my country. The media attention was great. The Euronews programme, Business Planet, hosted by the great Serge Rombi, made a wonderful video about Brandiko. Some national magazines also showed interest. It was very flattering, and encouraging. My colleagues were very happy for me. We were grateful! After getting the award, Brandiko had its best ever season – record-breaking participation from school kids who wanted to be part of the project. As Bulgaria had never been shortlisted at the European level before, my motivation was that this project was good enough to portray the country as a place where projects for entrepreneurial support can happen and possess European-level quality. I was very careful by presenting all the important details, and providing statistics to prove the project’s impact. It was important to provide accurate and to-the-point data and illustrate it in the most appropriate way. If you believe you’ve done a great job with your project, don’t hesitate to show it to the world! Good luck, everybody! The EU is the greatest place in the world! 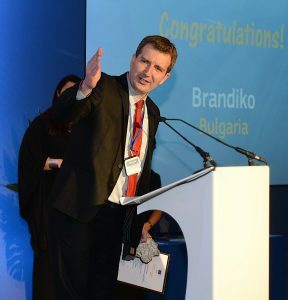 To find out more about Brandiko, visit the website at www.facebook.com/Brandiko or watch the video.